Dry eye syndrome (DES) or reratoconjunctivitis sicca is a very common eye disease characterized by eye dryness caused by either decreased tear production or increased tear film evaporation. DES affects 5 – 6% of the general population, but its frequency increases with aging. The prevalence rates in the elderly is roughly 1 in 3. As inflammation plays a central role in DES, researchers began looking at the effects of fish oils in this disorder. 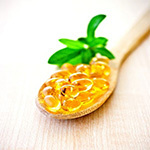 The long chain omega-3 fatty acids eicosapentaenoic acid (EPA) and docosahexaenoic acid (DHA) have been shown to reduce inflammation through a number of different mechanisms. Considerable evidence shows the benefits of EPA+DHA in improving various eye disorders, especially macular degeneration. Preliminary studies also show potential in the treatment of DES. To evaluate the role of dietary supplementation of EPA+DHA in dry eye syndrome 264 patients with dry eye were randomized to receive 1,000 mg EPA+DHA (650 mg EPA and 350 mg DHA) daily or a placebo for three months. There were 4 patient visits (at baseline, 1 month, 2 months and 3 months). On each visit, a detailed examination and questionnaire were conducted including various measures of tear function and signs of inflammation in the lining of the eyes. Results clearly demonstrated that 65% of patients in the EPA+DHA group and 33% of patients in placebo group had significant improvement in symptoms at 3 months. The improvement in symptoms was largely a result of reduced tear evaporation. Hence, it appears that the EPA+DHA help retain the water content of the lining of the eye. The best results were seen in patients with inflammation of the eyelids (blepharitis) and disorders of the meibomian glands – these glands secrete meibum, an oily substance that prevents evaporation of the eye’s tear film. Sometimes these glands can get congested and lead to chronic inflammation of the eyes and eyelids. Evidently a lack of EPA+DHA is a key underlying factor in meibomian gland function and a deficiency of EPA+DHA is likely responsible for many cases of chronic eyelid inflammation. More than 90% of the patients with chronic blepharitis showed improvements in tear function scores compared to less than 20% of patients in the placebo group. These results clearly highlight the importance of EPA+DHA supplementation in DES as well as blepharitis and meibomian gland disease. The dosage recommendation of 1,000 mg EPA+DHA is suitable for the promotion of general health, but when there is greater need or when used therapeutically the recommended level is 3,000 mg per day. While the results from this study are excellent, my feeling is that they would have occurred faster and been even more impressive if the 3,000 mg EPA+DHA dosage had been used. Reference: Bhargava R, Kumar P, Kumar M, Mehra N, Mishra A. A randomized controlled trial of omega-3 fatty acids in dry eye syndrome. Int J Ophthalmol. 2013 Dec 18;6(6):811-6.